I love butternut squash. It is by far one of my favorite winter vegetables out there. I could easily eat it all of the time, but I am unfortunately the only one in the house willing to eat it. So I’ve not had nearly as much of it as I would’ve liked. If you’re in a similar situation, I think this recipe could really work out for you. The squash isn’t in the lasagna rolls and instead provides a rich, thick sauce on top. You could easily make all of the lasagna rolls the same and serve up the butternut squash sauce for those who like it and have a marinara-style for those who want the traditional lasagna. I make and freeze lasagna rolls quite often so I definitely plan on freezing some of this sauce as well so I can have my butternut variety. 1. Preheat the oven to 450. Line a large baking sheet with foil. 2. Toss the squash with 1 tsp. olive oil and spread out in an even layer on the prepared baking sheet. 3. Roast for 25-35 minutes or until squash is fork tender. 4. Meanwhile, heat the remaining teaspoon of olive oil in a small skillet over medium-low heat. Add shallots and garlic and cook for 4-5 minutes, or until golden. 5. Allow squash to cool slightly, then transfer to a blender or food processor. Add shallots, garlic, water/stock and Parmesan cheese. Puree until smooth, adding more water/stock until it reaches your desired consistency. Season to taste with salt and pepper, then set aside. 6. Bring a large pot of salted water to a boil. Add lasagna noodles and cook until al dente. Allow noodles to cool slightly on a foil-lined baking sheet. 7. In a medium bowl, combine ricotta cheese, Parmesan cheese, egg, . Spread a 1-2 tablespoon-sized dollop of the mixture down each lasagna noodle. Carefully roll up each noodle and place seam side down on the baking sheet. 8. Preheat the oven to 350. 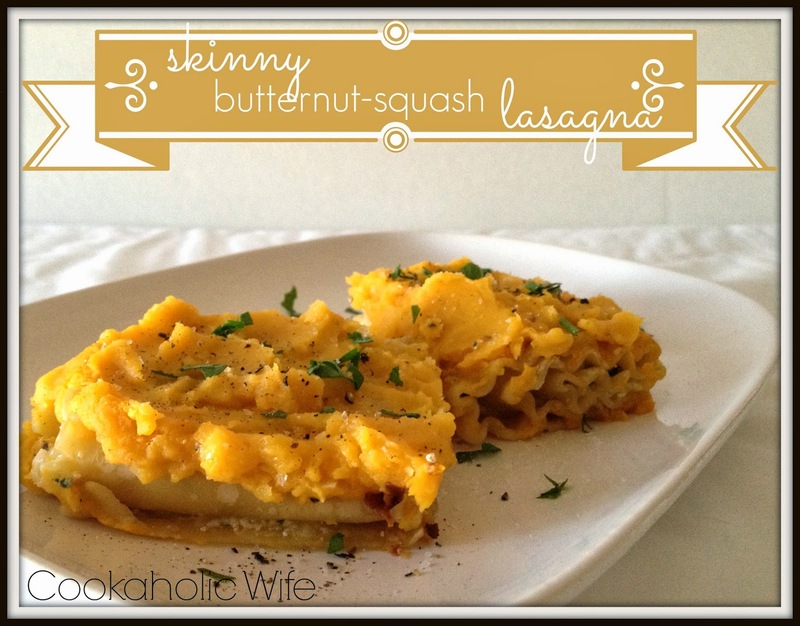 Spread 1/2 cup of the butternut squash sauce on the bottom of a prepared 9×13 baking dish. 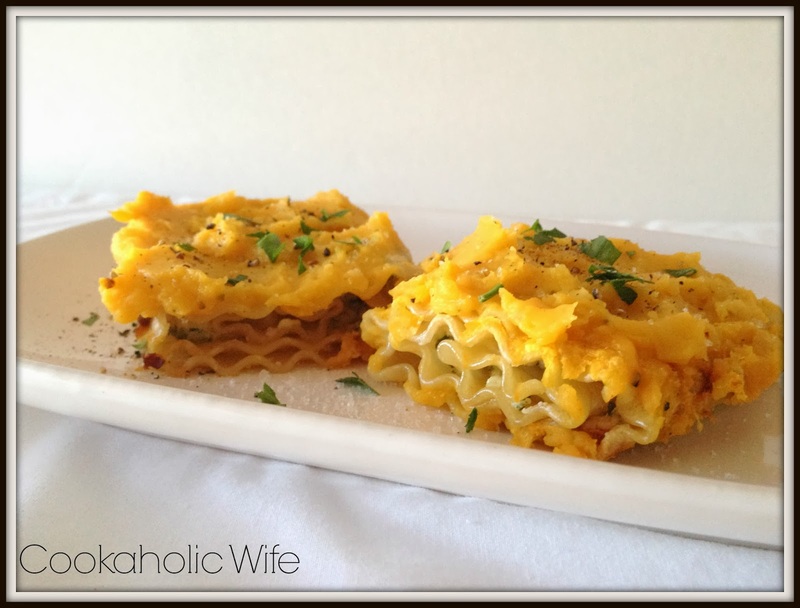 Place the lasagna rolls on top and then top with remaining butternut squash sauce. Sprinkle with Italian Blend cheese and bake for 40 minutes or until cheese has melted and is bubbly. *To Freeze: Follow directions until Step 7. Place the lasagna noodles on the baking sheet in the freezer for 1-2 hours, then transfer to a ziptop bag for further freezing. Sauce can also be divided into container and frozen once cooled. To serve, allow to thaw overnight in the refrigerator before completing Step 8. I wonder if the store still has butternut squash on sale. After typing this out, I’d really like to have this again soon.